A couple of weeks ago, I made this Cinnamon Oatmeal Bread for my mom for the first time. I usually like to stick to the recipe the first time around, so I surrendered to the call for 1 cup white flour. I ended up loving the bread and, since it was so simple, I decided it would be good morning toast bread. I usually eat Ezekiel or Silver Hills' Steady Eddie sprouted bread, but it's quite expensive and with my trip to Europe drawing nearer, every penny counts. Though I could stand to eat un-sprouted bread for a while, I could not stand to eat white flour. So, I decided it would be fun to try and change the recipe to 100% whole wheat, while maintaing its light, toast-able texture and without complicating the recipe too much. Unfortunately, while whole wheat flour has gluten and is useable, remnants of the nutritionally important bran interfere with the formation of the protein strands, resulting in a denser loaf. What a surprise, I came full circle. White bread flour is ideal for bread making—it has plenty of gluten and nothing to interfere with its formation for a chewy, well-structured bread. First and simplest, I used whole wheat bread flour instead of regular wheat flour, for the extra gluten. To compensate for the less than ideal characteristics of whole wheat flour's bran, I also added about 7 grams of gluten flour to my dry ingredients. I read you can add about 1-2 Tbsp for every 2-3 cups of white flour you replace. I also read that wheat flour is "thirstier" than white flour, and sources recommended adding a 1/4 cup of liquid for every cup of white flour replaced. Although I did this, it resulted in a much stickier dough...I ended up having to "dust" my loaf with so much flour, to keep it from sticking to my table, that I probably cancelled the extra liquid out. I think the most important step I took was so be very careful and accurate with my yeast. I used a thermometer to ensure the proper temperature and waited the full 10 minutes. When I went to check on it, it was huge...so much bigger than the first time I made this bread. 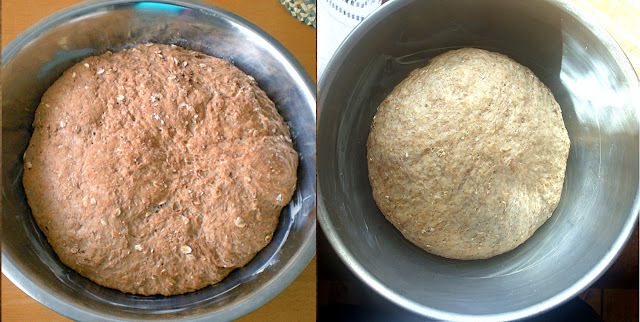 I hadn't originally intended on taking pictures of the process, since I did in the first post about this bread, but when I saw how big the dough was, I hurried to my room to grab my camera. * I realize I only used 2 tsp of cinnamon in the original trial of this recipe, but I really wanted the cinnamon to be able to stand up to the almond butter I knew I'd be eating with it. It worked both ways, so it's up to you to decide how much cinnamon you want. 1. Combine yeast with 2 cups of water at 100F and the honey. Stir gently and set aside for 10 minutes to allow the yeast to bloom. 4. On a lightly floured surface, knead dough. Continue to knead until dough is smooth and slightly sticky, about 15 minutes. Add flour as needed. 9. To make sure it is baked through, tap the bottom for a hollow sound. Let loaf cool completely before cutting, allowing crust and flavours set. This bread is wonderful—it's chewy, toasts perfectly and is most definitely not a brick. I cannot claim that any one step I took made the difference, but, pffft, I don't care, I'm just happy something worked (...I bet it was the yeast). It may not be as light as the loaf with white flour, but the difference is negligible. Anyways, I prefer a more substantial bread, especially since I eat it for my breakfast every morning...toasted with raw almond butter...it's my favourite part of the day...so sad it's over so soon and so quickly. I now will myself to sleep at night trying to make the morning, and this bread, come faster. This bread looks perfect!!!! Gah I wish I had more time to make proper bread like this.